I guess it’s really more accurate to call this a tube shootout than a review of tubes. 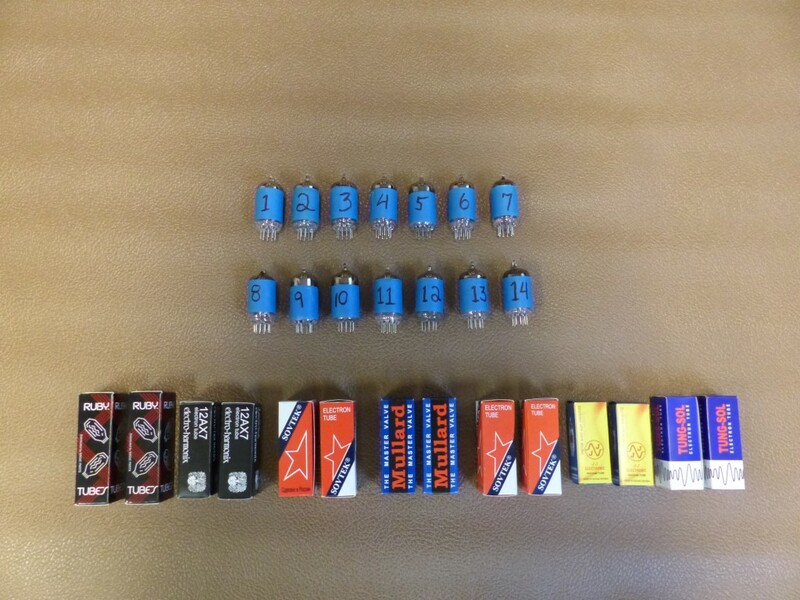 I’ve always wanted to do a review of 12AX7 tubes but felt that there were too many variables. I also didn’t trust my ears to be objective for long enough to really test all the different models available on different amps etc. The opportunity finally arrived when we (Andrews Amp Lab) celebrated our 10 anniversary at our current location in Dunwoody (Atlanta), GA.
Two of each tube were used so that one bad example wouldn’t skew the results. I had an assistant mix the tubes in random order and wrap each in 2 layers of blue masking tape to hide the labels so none of us knew which tube was which. Two guitar tracks of around 15 to 20 seconds were recorded direct on a Zoom H1 recorder, one clean on a Strat and the other more driven on a Les Paul. When these were played back, we were able to hear exactly the same guitar tone for every test on each amp. Each tube was installed in the respective amps, allowed to warm up just long enough so that the listeners could retain the memory of the last tube’s tone as clearly as possible. After all the tubes were heard, some participants requested to hear various pairs of tubes together for comparison. Most listeners kept notes of their impressions and rated the tone 1 – 5 on provided forms. At the end of it, they were asked for their ratings and comments. The results were interesting! All agreed that we were “splitting hairs”, that the differences in tone were slight and often difficult to hear. The highest rated and the lowest rated tubes in both amps were the two Mullards with one described as “loud and bright” and the other as “balanced”. They loved one the Mullards and hated the other. Other favorites for the overdrive tone were one of the EH tubes and one of the JJs. Some general comments about each tube. I’ve combined the comments for both tubes of each label. Because of that, you will see some differences of opinion. This was probably caused more by manufacturing inconsistencies than differences of opinion. Again, keep in mind that these differences were very subtle and often difficult for most participants to hear. Due to time constraints, we did not have the opportunity to adequately test for microphonics. In my experience, the tubes with the larger plates tend to have to be more microphonic. These would include the Sovtek LPS, and the Mullard. There appears to be a lot of variance in sound from different examples of the same tube. Fort this reason I was unable to prove or disprove my suspicion that the Mullard and Sovtek LPS are essentially the same tube with different labels and that the same goes for the EH and the Tung-Sol. Due to variances, it would be very difficult to choose a particular tube for its tone based on any previous experience, test, shootout, video, review or opinion since it’s unlikely that two tubes with the same label would sound the same. Still some of the general tone descriptions might be useful for those who are willing to spend time and money to make small changes in tone.